Lambert will be back . . . for the play-offs! Simon Lambert after crashing against Somerset. Stricken Panthers star Simon Lambert has vowed to be back for a play-off challenge. 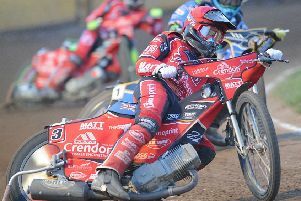 The Lincolnshire racer faces six weeks out with a broken left hand after being involved in a nasty crash during the club’s Premier League KO Cup quarter-final, second leg defeat against Somerset. Lambert hit the deck on the opening lap of heat three after picking up drive, clipping team-mate Nikolaj Busk Jakobsen and slamming into the fence. It is a cruel case of deja vu for the high-scoring star who also saw his 2015 campaign interrupted by a serious injury when in blistering form. Lambert said: “Something bad always seems to happen to me when things are going well. “If anything, I think this injury is a bit worse than the broken shoulder blade I had last year. “The doctors are telling me I’ll be out for six weeks and it is one of those injuries where you just have to sit and wait. “They don’t think I’ll need surgery so hopefully everything heals as it should. Lambert also suffered concussion in the spill and will require an MRI scan before being allowed to return to the track. He had been in explosive form at reserve with a series of double-figures scores before coming to grief in his first ride after climbing back into the main body of the team. Lambert has also impressed for Elite League side King’s Lynn of late. Panthers bosses are hoping to draft in a short-term signing to fill the void left by Lambert’s lay-off and promoter Ged Rathbone confirmed they have identified a possible target. Panthers are back in Premier League action next week with two home meetings in the space of four days. They host strugglers Scunthorpe on Tuesday (July 12) before entertaining a high-flying Berwick side on Friday, July 15. Panthers have dropped to fourth place in the standings after not racing in the league since their June 21 destruction of Plymouth.